Here you can see some of our clients results. We don't just say we can do something for you! We show you!!! It is amazing what a good trainer can do. Someone who has the knowledge, desire and ability to uncover your true potential. That person is Jay with Taylored Nutrition. As the saying go, the proof is in the eating of the pudding. I do as I am told nutritionally and work out per prescribed routine and "POW", well, the pictures tell the story. I get lots of questions as to how I do it. Hard freaking work is how!!!! Determination to be my own personal best. Patience...well, not so much LOL. Discipline to take the time to cook the meals, pack my meals, spend the time and energy training, working through challenges, going when I do not want to go, doing cardio even though I am beginning to dread the hard work it takes (I will pump iron any day over cardio). World>>>there is no EASY 20 min. fix, no magic pill, no secrets to success. There is the "HAVE TO" of having a knowledgeable, dedicated, available trainer that has your back 100% of the time. I thank God for Jay, his wisdom and dedication to seeing me achieve my goals. The next two weeks are going to be the toughest ever for me....but, with him in my corner, I will emerge, my metamorphosis will occur and I will actually be, to date, my "Own Personal Best". ★★★★★ "Best thong I have ever done!" I absolutely adore Taylored Nutrition. I have been a client for about 6 months. I have lost 60 pounds and kept it off. I gained a lot of weight and decided it was time to be healthy and make a change. 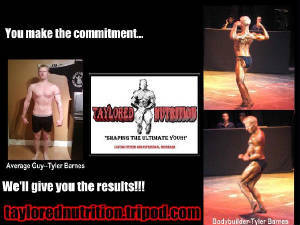 Contacting Jarueba Taylor at Taylored Nutrition is the best thing I have ever done for myself. He is so hands-on and motivates you. I always felt like he was right there with me and I know if I slip he will be on me to do better. I love it here and will not go anywhere else. ★★★★★ "Taylored Nutrition is the best I have had!" I have been working with Taylored Nutrition for 1 month now. I have lost 12 pounds and feel great! My trainer/nutritionist listened to me and designed a program just for me to get me back into a hot mama size. I have 2 small boys and gained over 90 pounds during pregnancy. I have had a terrible time trying to get rid of my baby weight and feel so ugly. I am slowly getting my confidence back through my work with Taylored Nutrition. I am so happy and feel worlds better about me. I highly recommend working with them if you need a lift of your spirits and need to shape up yopur body. It is so worth it!